For 35 years, fans of Blade Runner have discussed and deconstructed the original film while speculating about where the story might go next. Director Ridley Scott bolstered the movie’s mythos by participating in several reworked versions, including a 1992 “Director’s Cut” and a 2007 “Final Cut.” Although Blade Runner was not financially successful during its initial run, the movie garnered fame and followers as a result of the home video revolution and talk of a sequel began to percolate around the time of the Final Cut. For years, this was idle chatter but it gained traction once Scott and Harrison Ford indicated a willingness to become involved. Now, after more than a generation of dormancy, Rick Deckard is back. Unlike many sequels, this one isn’t content to regurgitate plot elements from its predecessor and rely on riding a wave of nostalgia. Blade Runner 2049 honors the original in many ways – some small and some large – but it’s not a soft reboot. It’s a new story with new ideas and new purpose. Strong strands connect it to the past but it blazes unique trails in a universe that is unmistakably the same and obviously different. If one was to compare this to the Star Wars franchise, it’s more like The Empire Strikes Back, which took chances, than The Force Awakens, which reworked previous themes and ideas. Since the marketing campaign has been built around the return of Harrison Ford/Rick Deckard, it’s safe to say that revealing his participation doesn’t count as a spoiler. But, if Deckard’s return isn’t a surprise, there are plenty of revelations/narrative turns that don’t play out as expected. Deckard doesn’t make his first appearance until the nearly-three hour movie is two-thirds of the way done but his presence looms large throughout. The main character in Blade Runner 2049 is a new Blade Runner, known variously as “K” or “Joe” (Ryan Gosling), whose job is to “retire” those few old model “skinjobs” who are still around. It seems that a new tycoon-inventor, Niander Wallace (Jared Leto), has created a race of replicants who are subservient but anything from the pre-2019 Tyrell Corporation needs to be eliminated. It’s a credit to the film’s storytelling that we don’t become impatient for Deckard’s return. We are invested in K’s story as a routine job takes him down a rabbit hole into one of the most carefully guarded and deeply buried secrets of the current regime. When she learns of this, K’s boss, Lt. Joshi (Robin Wright), expresses alarm that it could destroy everything. Just as Deckard’s seemingly straightforward mission in Blade Runner led him into a deep, dark spiral, so K’s job becomes more than a simple search-and-destroy mission. K is a loner but he’s not alone. He lives with a loving, devoted girlfriend. Joi (Ana de Armas) is the perfect match for someone as dour and introverted as K. His affection for her comes across clearly in their early scenes and, what initially seems like little more than an attempt at balancing and expanding his character embeds itself in the narrative flow. Blade Runner 2049 has two overarching themes, both of which will be familiar to science fiction fans. One questions the meaning of identity. The other, which is related, focuses on the concept of life, humanity, and the soul. The latter, of course, lay at the heart of Blade Runner, but Blade Runner 2049 uses a different approach to address it. With Ridley Scott unavailable to direct due to a conflict with Alien: Covenant, Denis Villeneuve was recruited. Villeneuve’s stellar resume, which includes Prisoners, Sicario, and last year’s outstanding science fiction offering, Arrival, assured that the film would be in good hands once Scott backed out. An avowed Blade Runner aficionado, Villeneuve took great pains to move the story forward while maintaining a balance between the old and the new. One of the most successful aspects of this approach is the way in which he addresses the great unresolved mystery of Blade Runner. Blade Runner 2049 is neither action-oriented science fiction nor space opera. In terms of approach, there’s a lot of Arrival in this movie’s DNA. The director wants viewers to think as well as experience. He values mystery and ambiguity. The ending, however, is satisfying in all the right ways. As in Blade Runner, there are action sequences – fight scenes, shoot-outs, spaceship combat. There’s a villain, the steely-eyed Luv (Sylvia Hoeks) who works as Wallace’s henchwoman. These things, however, are secondary elements – a spice used to enhance the flavor rather than a main ingredient. The narrative is constructed like a traditional mystery/procedural. Two things the average viewer is likely to remember about Blade Runner are the film’s look and sound. That movie’s vision of 2019 Los Angeles was a mix of the futuristic and the retro. For Blade Runner 2049, Villeneuve retains the skeleton of Scott’s design while using today’s special effects technology to expand it. 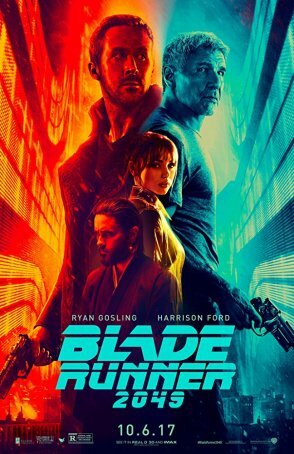 So Los Angeles 2049 is recognizably the same city but everything is bigger and brighter, as exemplified by a scene in which an oversized, neon (and naked) Ana de Armas reaches out to K. The sound design is loud and throbbing and composer Hans Zimmer pays homage to Vangelis without directly copying him. Just as Vangelis’ synth score gave an otherworldliness to Blade Runner, so the electronic aspects of Zimmer’s contribution (co-credited to Benjamin Wallfisch) maintains that feeling in this film. Harrison Ford has reached the stage of his career when he finds himself reprising old roles – Han Solo, Rick Deckard, and possibly Indiana Jones. In Blade Runner, Deckard was already world-weary. The last thing he wanted was to chase down Roy Batty and his cohorts. Here, Ford plays the character as an even more cynical, embittered individual. This represents one of the actor’s career-best performances. Often, he has gotten by on charm and charisma. Here, he has to delve deep to bring out Deckard’s soul. The “star” of the movie, or at least the person with the most screen-time, is Ryan Gosling. With Blade Runner 2049, he reinforces his ability to work effectively in any genre. He has under his belt such diverse fare as The Notebook, Lars and the Real Girl (which has a bizarre synergy with Blade Runner 2049), Drive, and La La Land. K may represent his most challenging role to date – there are many layers to the character – and Gosling adroitly captures every nuance. Supporting performances come from the likes of Robin Wright, Jared Leto, Sylvia Hoeks, Ana De Armas, and Dave Bautista. De Armas and Mackenzie Davis work together in a scene that recalls an aspect of Spike Jonze’s 2013 film, Her. And, in a nod to the original Blade Runner, Edward James Olmos has a cameo in which he completes one last origami figure. Sequels in general have an amazing capacity to disappoint. The pressure on filmmakers to equal or exceed the impact of a beloved original is intense. In a case like this, when the reputation of a movie has built over decades, expectations are elevated to an almost impossible level. With Blade Runner 2049, Denis Villeneuve has met those expectations by crafting a film that rivets the attention, excites the imagination, and engages the mind. In an era of instant gratification and mindless spectacle, how often can a big-budget science fiction franchise film make such a claim?